The Settlers Trail Wind Farm had its share of -20 degree construction weather, but White Construction, a veteran wind farm builder, still brought the project in on time, thanks to teamwork between construction crews, the community, and the project developer, E.ON Climate & Renewables. In the late 1800s, American settlers used small windmills to pump water for their farms, and some farmers later used windmills to generate electricity in their homes. A little over 120 years later, E.ON Climate &Renewables began operating the 150 MW Settlers Trail Wind Farm in Watseka, Illinois, with the help of White Construction. About the only thing these turbines have in common with their predecessors is that they generate energy from wind—lots of energy. In October 2010, E.ON completed business development on Settlers Trail, and White began construction in November. The $300 million project required over 51 miles of underground collector system cabling, two miles of transmission lines, 35 miles of county road upgrades, and 31 miles of permanent access roads. Not to mention, ninety-four GE 1.6-megawatt turbines on 80-meter towers. The $300 million Settlers Trail project required over 51 miles of underground collector system cabling, two miles of transmission lines, 35 miles of county road upgrades, 31 miles of permanent access roads—and ninety-four GE 1.6-megawatt turbines on 80-meter towers. Ron Ritter, the project manager for White Construction on the installation, was pleased to see GE turbines had been selected. 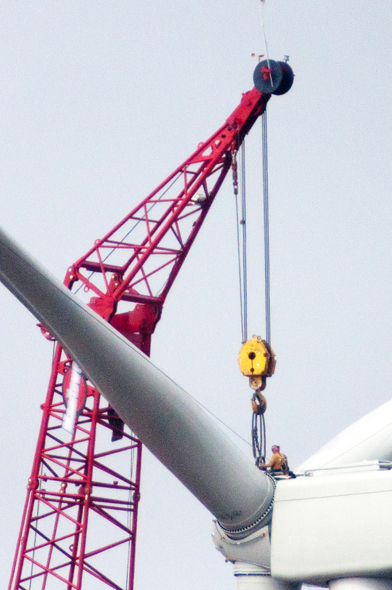 The turbines are easy to install, and White Construction has installed over 1,000 megawatts of GE turbines to-date. "GE has listened to input from owners and contractors and made modifications that make them very installation friendly," says Ritter. An example of the GE turbine's installation-friendliness is its electrical system. The components come in sections. 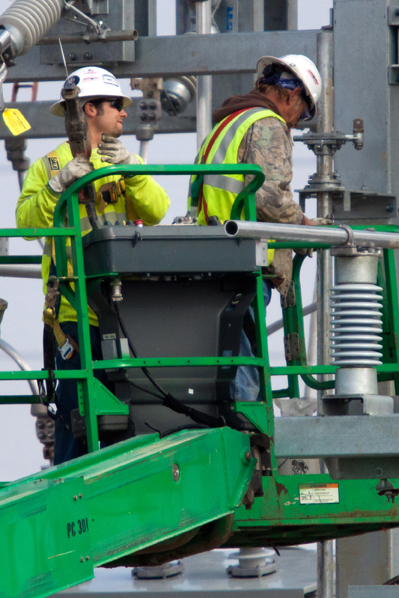 While some manufacturers bring an entire electrical system that has to be brought to the top of the tower and rigged from top to bottom, GE installs pieces of their electrical system in each component of the tower. When the sections are bolted together, it's just the inner connections that need to be installed versus the entire tower's worth of cabling. Because of GE's ease of installation, companies like White can save money. "It's much more cost-effective to build the electrical systems in the factory," says Ritter. "If you can power wire a turbine in one day versus three days, schedule and money all come into play." The biggest challenge on the Settlers Trail project was building the wind farm in the winter. Early spring delivery of the turbines meant that enough foundations had to be installed and backfilled so that trucks would be able to pull up to the foundation to drop off components for the cranes to pick up. The biggest challenge on the Settlers Trail project was carrying out construction during the winter. 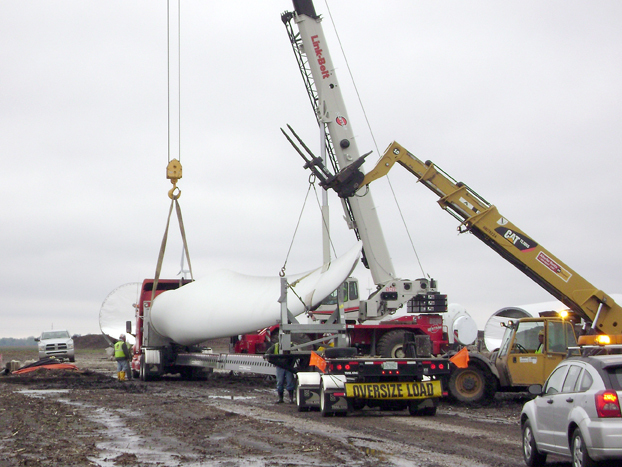 Early spring delivery of the turbines meant that enough foundations had to be installed and backfilled so that trucks would be able to pull up to the foundation to drop off components for the cranes to pick up. White Construction had to get 30 foundations completed before March. "The turbines were being delivered 10 per week, so that gave us a three week head start to stay ahead of deliveries while we continued to put the foundations in," says Ritter. It was a struggle to make the target. There were days that temperatures dropped to minus 20, keeping cement plants from delivering. On days that were just "very cold", concrete needed special treatment. "The company puts hot water in it when they batch it, so it doesn't set up too quickly," says Ritter. "Once we get it installed, the cement has an inherent characteristic—it generates heat—so that helps protect it from the cold. If necessary, we insulated the concrete after we installed it. White Construction has giant insulating blankets that the foundations are covered with until they meet their required compressive strength." When the weather did cooperate, the team went into overdrive, sometimes installing three 275-cubic-yard foundations a day. The substation construction schedule was also difficult to achieve, because it too, had to be built throughout the winter. But thanks to a diligent team, the tight deadlines were met. Before the turbines could be delivered and installed, 33 miles of county and township roads had to be upgraded. On that particular project, there was one bridge that required extra support, to increase its capacity to hold the weight of the turbines. And several large culverts had to be replaced. "It's one of the benefits of having a wind farm come into a community—it helps improve the infrastructure that normally the community wouldn't have the budget to handle," says Ritter. Ritter says the project, despite its challenges, was one of the smoothest installations he's done. "This wind farm went out in corn country, and the farmers and community members were a good bunch of people to work with, as well as the turbine manufacturer," says Ritter. "Also, E.ON's representatives—the owner of the project—were easy to work with. It was a very strong team effort between the contractor and the community and the developer. You never keep everyone happy, but to the greatest extent possible, this project achieved that." Matt Tulis, communications manager for E.ON, agrees it was a good group to work with. "We had some key land owners that were proponents of the project, and they helped us get other landowners on board. And county officials were really helpful to bring the project together." Although the project came in on time, White Construction is even more proud of the project's safety record. Not only were there no lost-time accidents, there were no recordable accidents either. While the Settlers Trail facility was under construction, the labor force was sizable. There were 80 to 100 workers handling road upgrades and foundation construction. The erection crew number ran between 60 and 80, and when the electricians arrived, there were up to 300 people on site. "We worked a lot of man hours, drove a lot of project miles, and sent everybody home in good condition with a pretty nice paycheck," says Ritter. Bringing this size workforce into a rural town gives it a welcome boost, especially helpful during a down economy. Most of the workforce on Settlers Trail was local labor so the project brought in a huge influx of wages. Also the staff that was brought into the area rented houses, leased hotel rooms, and rented cars, which was a large infusion of money into the local community. The labor force was sizable on the Settlers Trail project. There were 80 to 100 workers handling road upgrades and foundation construction. The erection crew number ran between 60 and 80, and when the electricians arrived, there were up to 300 people on site. During the project, other businesses were also getting more traffic—from the local hardware store to the local restaurants. 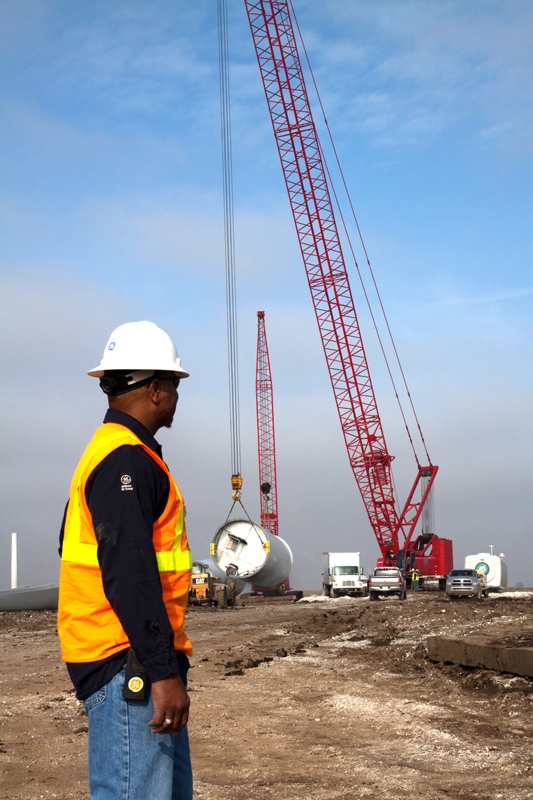 Now that the Settlers Trail project construction is completed, about a dozen individuals remain as permanent employees to operate and maintain the wind farm. White Construction tries to go the extra mile to be a good neighbor to the communities they work in. 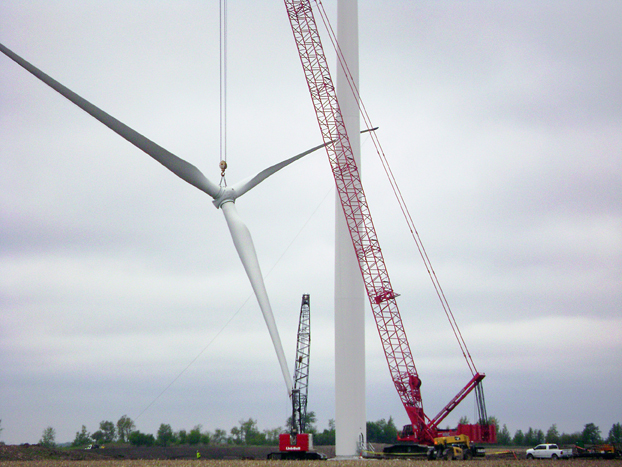 For example, during construction, White had a ten-acre laydown yard and a four-acre turbine component staging area, both of which were graveled. There were office trailers, wells, septic systems and electrical systems, and T1 lines—all the infrastructure required for a commercial office complex. "When we were done, we picked up all the gravel and removed all of the utility infrastructure, took the fences down, and spread the topsoil back over the property. We also gave a lot of the gravel back to the community," says Ritter. It's hard to say for sure, but the original settlers of the area would likely be amazed by the size of the wind farm at Settlers Trail, but they wouldn't be surprised at the labor and teamwork that went into it. As both Ritter and Tulis attest to, it takes a lot of old-fashioned hard work to get a wind farm up and generating electricity.